This is the view of a receiver pilot taking gas from a KC-97. I am not sure of the receiver type, but it might be a B-47. A Northrop YF-23 inches toward the boom of a KC-135 during the Advanced Tactical Fighter test program. Click image to enlarge. The YF-22 and YF-23 were competing in the USAF’s Advanced Tactical Fighter (ATF) program, conceived in the early 1980s, to provide a replacement for the F-15 Eagle. Contracts for the two most promising designs were awarded in 1986. The YF-23 was designed to meet USAF requirements for survivability, supersonic cruise (supercruise), stealth, and ease of maintenance. Designed with all-aspect stealth as a high priority, Northrop drew on the company’s experience with the B-2 Spirit and F/A-18 Hornet. The YF-23 was an unconventional-looking aircraft with trapezoidal wings, substantial area-ruling, and a V-tail. It introduced the novel feature of rear jet nozzle troughs lined with heat ablating tiles developed by Allison, which shielded the exhaust from infrared (IR) detection from below. All the control surfaces were coupled together via the Vehicle Management System to provide “net effect” aerodynamic control. The wing flaps and ailerons deflected inversely on either side to provide yaw, while the tail provided pitch. Aerodynamic braking was achieved by deflecting the flaps and ailerons on both sides simultaneously. Although possessing an advanced design, in order to reduce costs and development, a number of F-15 Eagle components were utilized including the standard F-15 nose wheel unit and the forward cockpit of the F-15E Strike Eagle. Two aircraft were built. YF-23 #1 (PAV-1) was fitted with Pratt & Whitney YF119 engines, while YF-23 #2 (PAV-2) was fitted with General Electric YF120 engines. The YF-23 featured fixed nozzles. The first YF-23 was rolled out on 22 June 1990, and first flew on 27 August 1990. YF-23 #2 first flew on 26 October 1990. The black YF-23 (PAV-1) was nicknamed “Black Widow II”, after the Northrop P-61 Black Widow of World War II and had a red hourglass marking resembling the underbelly marking of the black widow spider. The black widow marking was briefly seen under PAV-1 before being removed at the insistence of Northrop management. The gray colored YF-23 (PAV-2) was nicknamed “Gray Ghost”. Both YF-23s were furnished in the configuration specified before the requirement for thrust reversing was dropped. The weapons bay was configured for weapons launch but no missiles were fired, unlike Lockheed’s demonstration aircraft. The YF-23s flew 50 times for a total of 65.2 hours. The YF-22 achieved Mach 1.58 in supercruise. The first YF-23 with P&W engines supercruised at Mach 1.43 on 18 September 1990 and the second YF-23 with GE engines reached Mach 1.6 on 29 November 1990. The flight testing demonstrated Northrop’s predicted performance values for the YF-23. The YF-22 won the competition in April 1991. The YF-23 design was more stealthy and faster, but the YF-22 was more agile. It has been speculated in the aviation press that the YF-22 was also seen as more adaptable to the Navy’s Navalized Advanced Tactical Fighter (NATF), though as it turned out the US Navy abandoned NATF a few months later. 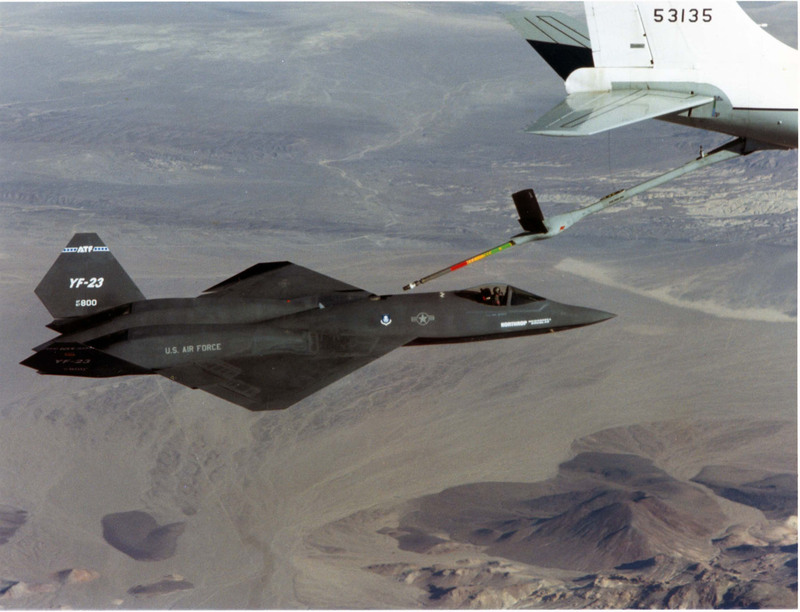 After losing the competition, both YF-23 prototypes were transferred from Northrop to NASA’s Dryden Flight Research Center, at Edwards AFB, California. The engines were removed. NASA had no plans to perform flight tests with the airframes, but a proposal was put forward to use one of the two aircraft to study strain gauge loads calibration techniques. The possible production configuration of the F-23A has never been publicly revealed. This video is taken from the left blister window of a Boeing KB-50 during the refueling of a Lockheed F-104 Starfighter. The F-104 advances forward too rapidly which causes slack in the hose to develop. 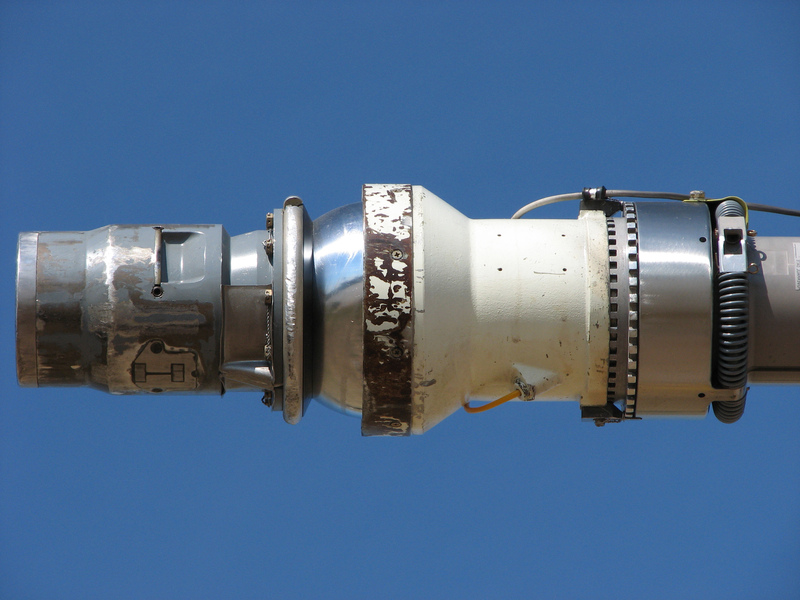 The slack hose condition is usually prevented by a response system in the pod that rewinds the hose to prevent such an event from occurring, but if the receiver exceeds the limitations of the system this condition can still happen. KC-10 Boom Nozzle. Click image to enlarge. KC-135 Boom Nozzle. Click image to enlarge. Shown here are the nozzles of the KC-10 and of the KC-135. The nozzle mates to the air refueling receptacle installed on the receiver aircraft. The nozzle incorporates a ball joint swivel and a universal joint. These two items provide flexibility to the nozzle assembly that is required when making contact and when the tanker and receiver are hooked up. The universal joint is used to transmit impact loads through the nozzle assembly to the shock absorber recoil assembly. The nozzle assembly is approximately two feet long. A spring-activated check valve, referred to as the poppet valve, forms the fuel seal in the aft end of the nozzle when not in contact. The poppet valve is automatically depressed during the coupling operations by the receiver’s receptacle assembly. The spring in the poppet valve assembly, coupled with fuel pressure, exerts sufficient force on the poppet valve to close it rapidly, which results in very little fuel spillage. The resultant surges in fuel pressure are absorbed by the rubber surge boots. The boom nozzle incorporates an induction coil at the 6 o’clock position that allows the tanker and receiver air refueling signal systems to transmit contact and disconnect signals. The induction coil also allows the two aircraft to share interphone communications. At the 3 o’clock and 9 o’clock position on the nozzle are detents that the receiver’s latch toggles engage when contact is established. 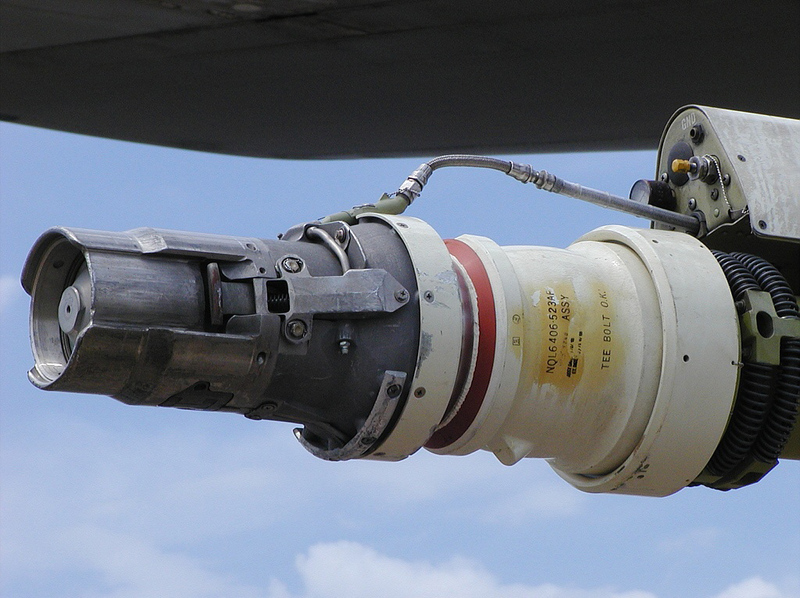 The detents on KC-10 nozzle can be retracted (IDS), this allows the tanker to disconnect from the receiver even if the receiver’s air refueling system malfunctions. The independent disconnect system (IDS) is an electrically controlled, pneumatically actuated system located in the nozzle assembly. Pneumatic pressure is supplied from a compressed air reservoir mounted on the telescope tube. The IDS is operated by depressing the disconnect switch through the second detent. When the system is activate, pneumatic pressure reacts the toggle latches on each side of the nozzle to a flush position. This allows the boom to be retracted from the receiver aircraft while its toggles are in the latched/extended position. The toggle latches have a holding circuit installed that retains them in the retracted position after IDS actuation, until the RESET TO READY button is pushed. Skip forward to 2:50 to see the refueling between the Convair B-58 Hustler and a Boeing KC-135 Stratotanker. This is a very interesting video clip showing a KC-135 refuel a B-58 Hustler. For those familiar with refueling, the closure rate is sure to frighten you. 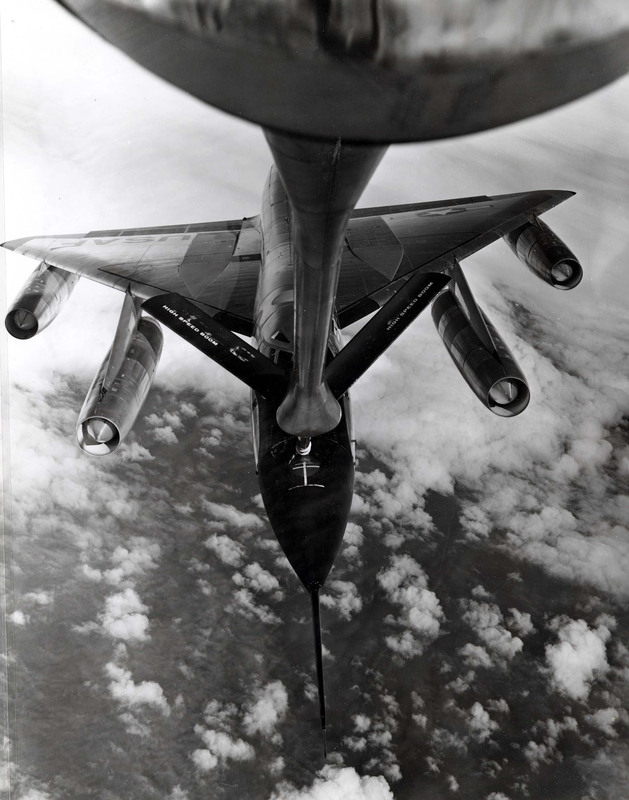 Be sure to read this post for more B-58 refueling. A Polish Air Force F-16 pilot receives fuel from a U.S. Air Force KC-135 from the 100th Air Refueling Wing during a NATO exercise April 7, 2009 near the European continent. The KC-135 Stratotanker is capable of delivering fuel to more than 20 F-16 aircraft in a single mission. (U.S. Air Force photo by Staff Sgt. Jerry Fleshman) Click image to enlarge. May 14, 2009 – A group of Airmen with the 100th Air Refueling Wing traveled to Tampere, Finland, May 2 to participate in a week-long exercise with Navy and Finnish Air Force F-18 Hornet pilots. The Airmen helped teach the Finnish pilots how to refuel in-air from a KC-135 Stratotanker. The exercise marks the first time United States Air Forces in Europe has deployed a tanker team to Finland for an air-to-air refueling operation. The Finnish Air Force has been flying F-18s since the mid-1990s, but air-to-air refueling is a fairly new concept to the country’s Hornet pilots. According to the Finnish Air Force’s 21st Fighter Squadron, some of the unit’s pilots have refueled other aircraft in air, but the majority of them are inexperienced with the procedure. The captain said the training helps the squadron, and the service as a whole, meet a government requirement to be able to deploy outside Finland to support NATO forces. Although Finland is not a member of NATO, it is a part of the organization’s Partnership of Peace program, which USAFE also supports. “This opens our eyes to a much wider operating area,” said the captain. One of the primary missions of the 100th ARW is providing air refueling support to the United States’ European allies, said Capt. Aaron Torczynski, KC-135 aircraft commander. The 100th ARW is the sole refueling unit for the European theater, supporting NATO members and broadening the range of air assets flying around the globe. Everyone involved with the training was enthusiastic and eager to learn and the tanker crew was especially proud to participate in this historical mission, Captain Torczynski said. Captain Torczynski said the Finns have been supportive on all aspects of the mission, from airborne operations to assisting Air Force maintainers with pre- and post-flight duties. The Air Force crew arrived in Finland a week after a pair of Navy F-18 instructor pilots began teaching the Finns the fundamentals of air-to-air refueling. While the Finnish pilots fly the same type of aircraft, the similarities between how the countries’ aviators operate them are sparse. Each of the 16 Finnish pilots who were trained required a minimum of three flights to become qualified for air-to-air refueling. 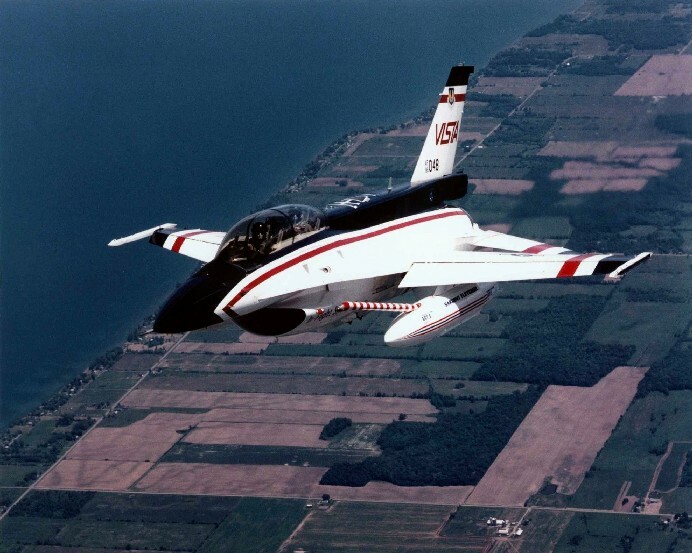 The first flight took place with an instructor in a two-seat F-18D model and the last two in a single-seat F-18C. Each pilot aimed to have six solid connections, or “contacts,” with the refueling receptacle. While 18 contacts are needed to be fully qualified, each pilot’s qualification is based on feedback from the instructors and is ultimately decided by the squadron commander. Once qualified, the pilots will assist in the instruction of the rest of Finland’s F-18 pilots. Still, the Finnish pilots weren’t the only ones who received training from the exercise. Since the Air Force doesn’t fly any fixed-wing aircraft that refuel with the probe and drogue system, boom operators in the back of the KC-135 gained valuable experience from the training, Captain Torczynski said. “Any time these guys get to step outside the norm and hone their skills on something they don’t see every day is a great benefit for the Air Force,” he said. There are no plans for the Air Force to return to Finland for this type of mission anytime soon. The plan is to have newly qualified Finnish Air Force pilots take over the training. “This training not only allows Finland to reach out and assist other nations, but it helps build strong partnerships between the United States and our European allies,” Captain Torczynski said. 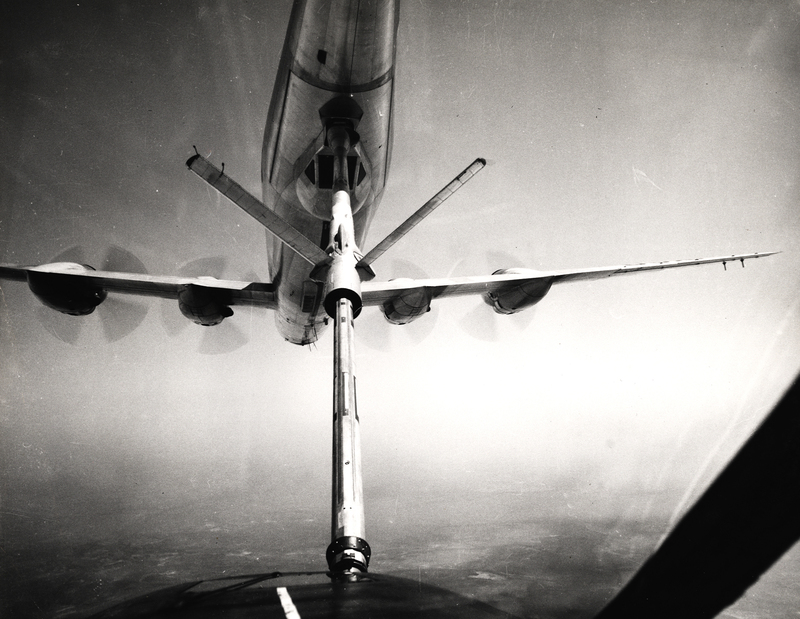 Convair B-58A refueled during Operation Heat Rise. (U.S. Air Force photo) Click image to enlarge. The B-58A set three speed records during Operation Heat Rise on March 5, 1962, and in the process won both the Mackay and Bendix Trophies for that year. The B-58 was crewed by Capt. Robert G. Sowers, Capt. Robert MacDonald, and Capt. John T. Walton. The crew was randomly selected from Carswell AFB’s 65th bomber squadron. They spent four months preparing for the mission by practicing air refueling and other mission related tasks. The B-58 selected for the operation was an unmodified production model and was representative of the entire B-58 fleet. Special care was taken by maintenance crews to wax and polish the aircraft to ensure that aerodynamic drag would remain as low as possible. The flight profile involved taking off from Carswell AFB, TX and flying to the starting point which was overhead Los Angeles, CA. The B-58, callsign Tall Man 55, was refueled over the Pacific Ocean by a KC-135 Stratotanker so that its tanks would be topped off prior to crossing the start line. After accelerating to mach 2.0 the B-58 crossed the start line. However the radar equipment designed to track when the aircraft crossed overhead failed and the Hustler was recalled so that it could start over. Since the B-58 had already expended some of its fuel, it was required to return over the Pacific Ocean so that it could rendezvous with the KC-135 again and top off its tanks. After receiving its second topoff, the B-58 proceeded across the start line a second time where it was visually validated as having crossed the starting point. Flying at over twice the speed of sound, the B-58 flew eastward under the power of its four General Electric J79 engines. For this special mission the aircraft was allowed to operate faster than its designed maximum speed. While flying at such high speeds, the airframe becomes hot due to air friction. The B-58’s designed temperature limit was 115ºC but the Convair engineers deemed it safe to operate at 125ºC. Any faster and the honeycomb aluminum skin would begin to debond. This increased temperature limitation allowed the crew to push the aircraft to over 1400 miles per hour. During the 5 hour duration of the record setting flight the aircraft was cleared a 25,000′ (FL250-FL500) altitude block through a corridor that spanned the entire country. After cruising at mach 2.0+ and 50,000′ from Los Angeles, the B-58 began to descend toward a tanker orbiting over Kansas at 25,000′. The B-58 had lost its navigation radar which complicated the rendezvous and added several minutes to the flight time. After some help from the tanker, the B-58 successfully rendezvous with the KC-135 and they proceeded eastbound while filling the Hustler’s tanks. During this A/R the B-58 onloaded 85,000 lbs of fuel at a transfer rate of 4,000 pounds per minute. After 21 minutes of refueling the two aircraft separated and the B-58 once again accelerated to mach 2.0+ and climbed to 45,000′. A temperature inversion over Kansas hampered the bomber’s ability to climb and slowed its time slightly. The Hustler crossed the finish line over New York City 2:00:58.71 after it crossed Los Angeles. The B-58 had completed one direction of its flight, now it had to fly the reverse direction. After it crossed New York, the bomber descended for air refueling over the Atlantic Ocean. Now on a westbound heading, the B-58 chased the Sun toward Los Angeles. It once again descended at the midway point over Kansas to refuel from another KC-135 to receive its topoff. Post A/R, it made its final dash toward the finish line above Los Angeles. Even having battled the jet stream during its entire westbound flight, the B-58 crossed the finish line in 2:15:50.08, having beat the Sun from New York to LA by 45 minutes. The entire flight (LA-NYC-LA) took a mere 4:41:14.98 and averaged 1,214.71 miles per hour (~5,690 miles) including the three enroute air refuelings. The flight did not go unnoticed by the general public. The Air Force received over 10,000 complaints of broken windows across the country that were caused by the sonic boom that the supersonic bomber created as it flew across the country. This single event changed the course of aviation history because it emphasized the negative public reaction to sonic booms which resulted in multiple supersonic transport aircraft designs being canceled, with the Concorde and TU-144 being notable exceptions. Operation Heat Rise may be remembered for the blazing speed at which the B-58 crossed the country, but the operation would have never been possible without the five air refuelings that provided the bomber with fuel. In total, 10 KC-135s supported the bomber’s flight. This F-16 is fitted with a Sargent Fletcher 370-Gallon Aerial Refueling Tank/System that allows the aircraft to refuel from drogue equipped tankers. Click image to enlarge. 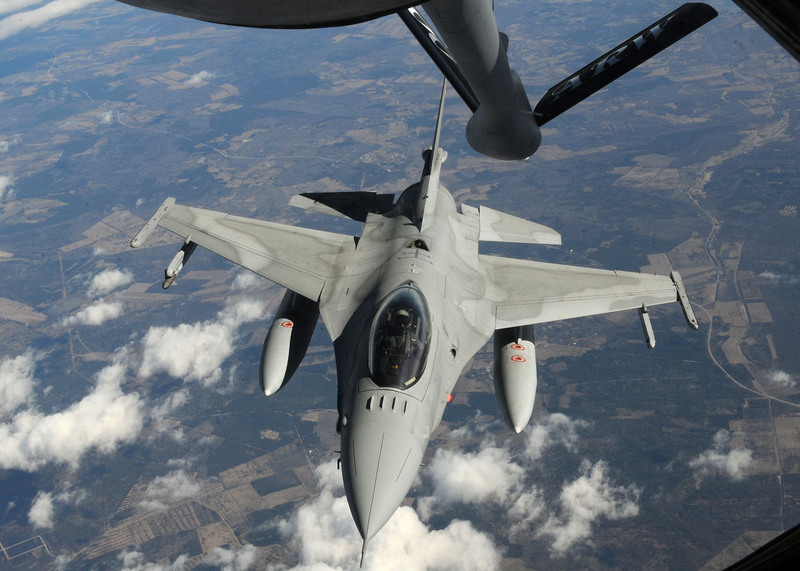 In this picture a Sargent Fletcher Aerial Refueling Tank/System (ART/S) pod is attached to an F-16 VISTA. This unique concept is the product of the vast Sargent Fletcher experience in External Fuel Tank and Probe/Drogue Aerial Refueling systems design. The Sargent Fletcher 370-Gallon wing tank is modified to accept a retractable probe that will permit a F-16 aircraft to receive fuel from a Probe/Drogue-equipped tanker. A proof of concept flight test was conducted to verify the compatibility of the design to the hoop-up loads. No fuel was transferred in this test. Instrumentation was installed to measure loads, deflection, and stiffness. The test confirmed the loads placed on the probe and the ease of hook-up including the compatibility of the system to several different tankers. VISTA with ARTSA later test was conducted with the ART/S® installed on the specially configured F-16 Variable Stability In-flight Simulator Test Aircraft (VISTA). The VISTA test flights confirmed that the ART/S® was compatible with various aircraft computer programs. When a F-16, and many other aircraft in the USAF inventory, is equipped with an ART/S®, it can receive fuel, not only from the boom/receptacle tankers, but also from any tanker in the worldwide fleet. The Lockheed Martin F-16 VISTA (“Variable stability In-flight Simulator Test Aircraft”) program, which ran from 1988 to 1997, began as a privately funded joint venture between General Electric and General Dynamics, to produce a Multi-Axis Thrust-Vectoring (MATV) variant of the Fighting Falcon. The F-16 VISTA testbed aircraft incorporated a multi-axis thrust vectoring (MATV) engine nozzle that provides for more active control of the aircraft in a post-stall situation. The resulting aircraft is supermaneuverable, retaining pitch and yaw control at angles of attack beyond which the traditional control surfaces cannot change attitude. The VISTA program was considered successful, but the thrust vector control (TVC) never made it into production fighter versions. The program was also notable for the development of Direct Voice Input and the “Virtual HUD”, which were both eventually to be incorporated into the cockpit design for the F-35 Lightning II. The STOVL F-35 variants also incorporate MATV while hovering to provide attitude control. 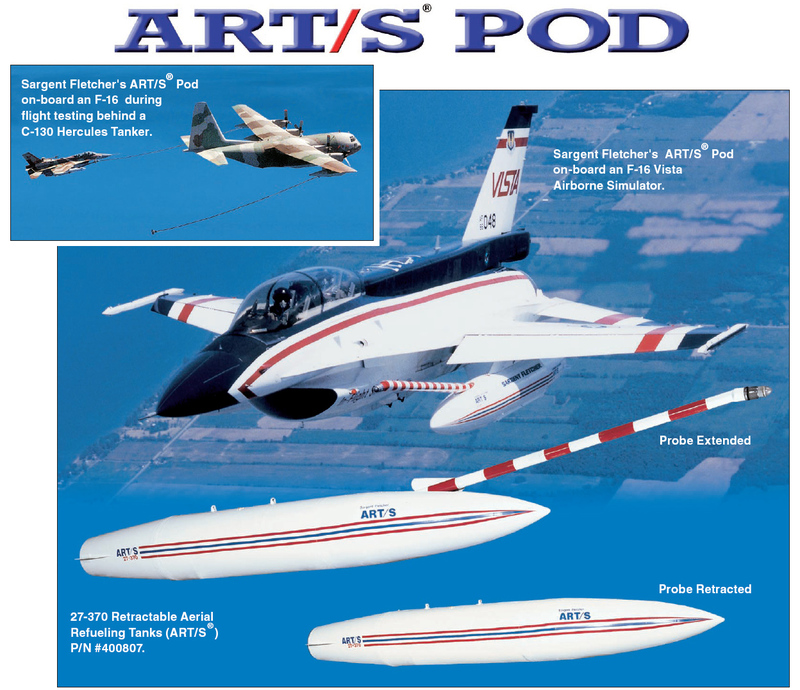 The Sargent Fletcher ART/S Pod features a retractible refueling probe. Click image to enlarge. A Lockheed C-5A moves into pre-contact behind a NKC-135A that has been fitted with the Advanced Aerial Refueling Boom designed for the KC-10. Click photo to enlarge. In this rare picture, a Lockheed C-5A Galaxy is seen behind an NKC-135A that has been fitted with a KC-10 boom. The advanced fly by wire boom was attached to the NKC-135 during the KC-10’s development to test the handling characteristics. The KC-10 boom consists of two aerodynamically faired tubes, one telescoping within the other. The telescoping tube is supported by rollers within the outer tube. A fixed tube is located inside the telescoping tube. A sliding seal provides passage of fuel without leakage. The boom is attached to the tanker by a gimbal unit. The boom is free to move throughout the operating envelope. A fuel line swivel and flexible fuel line provide passage of fuel from the aerial refuel system across the boom pitch and roll axis through the fixed tube at the forward end of the boom. A surge boot running the entire length of the telescope tube dampens fuel surges during coupled flight or disconnect. The surge boot is pre-charged with dry nitrogen or air. The boom flight control actuation system is an integrated closed-loop, fly-by-wire system utilizing a boom control unit with fail-passive fault monitoring and self-test features. The boom flight control actuation system consists of the boom control unit, an elevation/roll hand controller, linear and rotary position transducers, accelerometers, nozzle load sensors, elevator and rudder actuators, a boom controller force selector, annunciator lights, and switches. A status/test panel is provided for displaying built-in-test information from the boom control unit. The boom control surfaces consist of two fin/rudder assemblies attached to the elevator tips. The elevator is attached to the fixed tube by a combined hinge/actuator fitting. Boom positioning (elevation and roll) during free-flight is accomplished through the use of the elevation/roll hand controller, commonly referred to as the boom flight control stick. The boom operator uses the boom flight control stick to make inputs to move the boom, the boom control unit interprets these inputs and sends the appropriate signals to the actuators of the control surfaces. During coupled flight, an automatic load alleviation system (ALAS) is automatically activated to minimize nozzle radial loads by trimming the boom control surfaces to track the receiver aircraft position during coupled flight. While in contact, the boom operator monitors the system and guards the boom flight control stick, taking necessary actions when needed. Axial loads are also automatically limited by the telescoping system. The boom operator selects the proper disconnect limits and telescope-at-disconnect switch positions during preparations for contact operations. Once a receiver aircraft is in the proper position within the refueling envelope, and alignment of the boom nozzle and receiver is achieved, the boom is extended to insert the nozzle into the receptacle. When insertion is completed, the control system advances to the coupled mode. The ALAS mode, if preselected, is automatically actuated. Automatic disconnects occur if preselected limits are exceeded. If preselected, automatic retraction occurs at the time of disconnect. Receiver tracking/nozzle load alleviation is accomplished through two methods: couple flight control law logic and ALAS. coupled flight control laws are active anytime the flight controls are in the COUPLED mode. ALAS is active anytime the ALAS switch displays ENABLED and the flight control system is in COUPLED mode. The flight control system can be advanced to COUPLED bye establishing a contact; pressing the contact made TEST switch; or pulling and holding EMER CONTACT MADE switch. The flight control system also advances to COUPLED whenever sustained nozzle loads greater than 500 pounds are experienced; however, ALAS is not active during this condition. The COUPLED mode of the flight control system is designed to partially alleviate nozzle loads and allow the boom to follow receiver movements. Receiver tracking/nozzle load alleviation is accomplished by utilizing boom position information to generate commands to back drive the flight control stick to approximate boom position in relation to the receiver. Boom operator assistance may be required to minimize loads to an acceptable level. Air refueling is accomplished with ALAS ON unless the system malfunctions. Receiver tracking/nozzle load alleviation is accomplished through the detection of nozzle loads by the nozzle load sensor assembly and back driving the flight control stick to align the boom with the receiver. ALAS maintains nozzle loads at an acceptable level without boom operator assistance. However, the boom operator can override ALAS. It takes approximately one second after contact is established or the EMER CONTACT MADE switch is pulled to transition the flight control laws from FREE FLIGHT to COUPLED logic, and to back drive the boom flight control stick to correspond with boom position. After once second; ALAS is turned on, the stick shaker is armed, the stick forces are increased to their maximum value and the COUPLED light comes on. The increased stick forces and stick shaker are designed to reduce inadvertent boom operator inputs to the flight control system when ALAS is active. Moving the flight control stick form its commanded position as little as 4º activates the stick shaker which vibrates/shakes the boom flight control stick. ALAS continues to alleviate nozzle loads after a disconnect is initiated (DISC light on) until the selected RCVR DISC DELAY time setting; at that point, the COUPLED light goes off, ALAS ceases to alleviate nozzle loads, the stick shaker is deactivate, the control stick forces return to their selected values, the controller back drive is frozen in the last commanded position for two seconds and the flight control laws start transitioning from COUPLED to FREE FLIGHT over a one second period. An ALAS failure is indicated by the ROLL ALAS INOP and/or ELEVATION ALAS INOP light illuminating. The two axes are independent of each other and receiver tracking and stick shaker continue to function in the operation axis. Both the coupled flight control law logic back drive and ALAS are inoperative when a failed stick condition exists. Failure of the flight control stick is indicate by: the ROLL ALAS INOP and/or Elevation ALAS INOP light(s) illuminating, a five second audible tone in the boom operator’s headset, and the boom flight control stick going limp in the failed axis. Th telescopic actuation system provides extension and retraction of the telescoping tube during freeflight and controls receiver’s push/pull forces in the coupled mode. The system consists of a telescoping tube, a closed loop chain-cable drive, a hydraulic servo motor, two telescope control sticks, a position indicator, and annunciator light. Telescope control is provided through two telescope control sticks; one each at the boom operator’s and instructor boom operator’s position. Each stick extends or retracts the boom; however, commands from the instructor’s stick overrides inputs from the boom operator’s position. The independent disconnect system (IDS) is an electrically controlled, pneumatically actuated system located in the nozzle assembly. Pneumatic pressure is supplied from a compressed air reservoir mounted on the telescope tube. The IDS is operated by depressing the disconnect switch through the second detent. When the system is activate, pneumatic pressure reacts the toggle latches on each side of the nozzle to a flush position. This allows the boom to be retracted from the receiver aircraft while its toggles are in the latched/extended position. The toggle latches have a holding circuit installed that retains them in the retracted position after IDS actuation, until the RESET TO READY button is pushed. 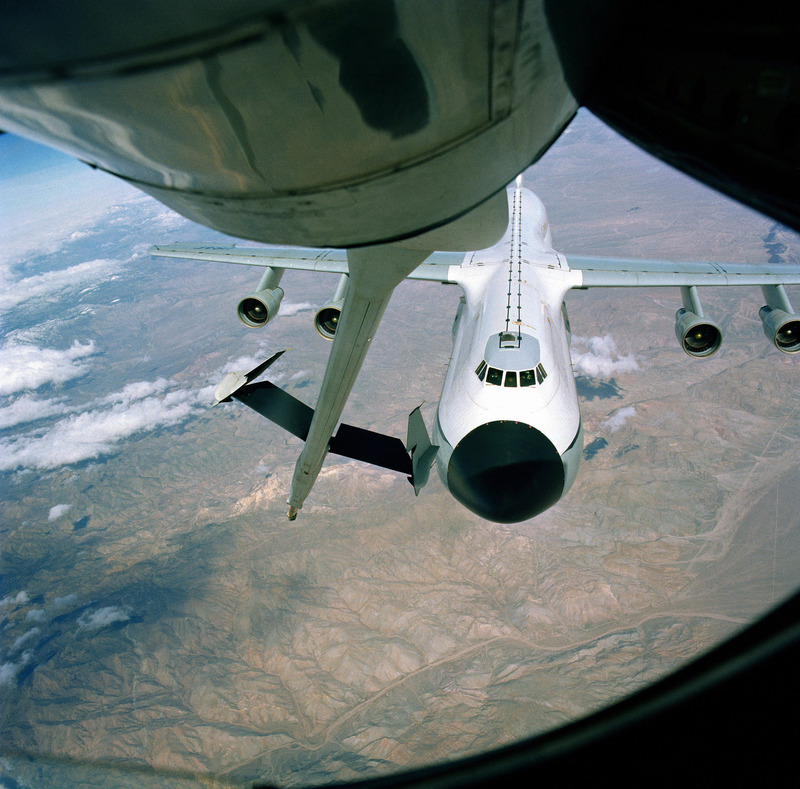 Under various designations, including NC-135A, NKC-135A and NKC-135E, NASA and the U.S. Air Force operate a fleet of heavily-modified C-135 airframes as aerial testbeds. The type of work performed by these aircraft is greatly varied, but includes refueling tests with new aircraft types, airborne laser trials, weightlessness training for astronauts, and numerous programs involving the testing of airborne equipment and space technology. Rockwell International B-1A (S/N 74-0159) is refueled by Boeing KC-135A (S/N 62-3527) during the B-1B flight test program. (U.S. Air Force photo) Click image to enlarge. 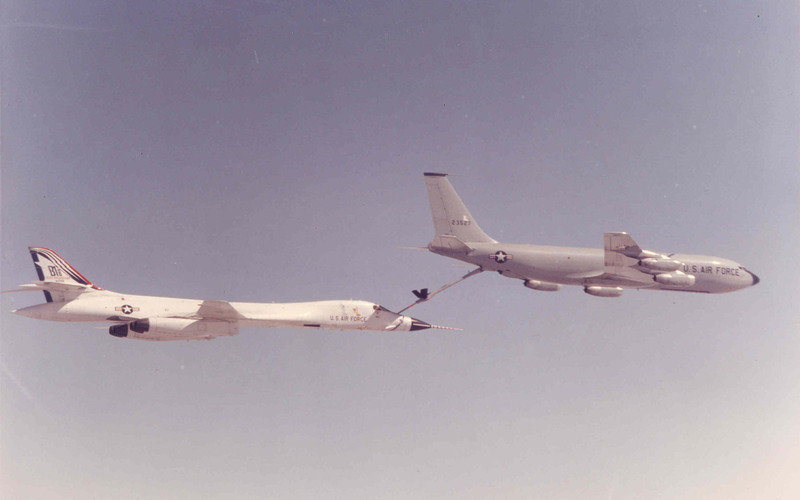 In this picture a KC-135A is in contact with a Rockwell B-1A. The vertical fin says “B-1B”, but this is because the aircraft is participating in the test program that would eventually spawn the B-1B. The B-1A was a faster version of the B-1 and reached a maximum speed of mach 2.22 compared to the B-1B’s top speed of mach 1.2. During refueling the B-1 is able to accept up to 1,000 gallons per minute of fuel, even then it can take over 20 minutes to fill the tanks.